This #AJChallenge day was fun because of the research involved. I learned about a few medicinal plants that I was unaware of. My goal was to find something that fit the category that I would have a photo resource for. I found it! Rose Hips. According to webMD: Rose hips are used for stomach disorders including stomach spasms, stomach acid deficiency, preventing stomach irritation and ulcers, and as a “stomach tonic” for intestinal diseases. They are also used for diarrhea, constipation, gallstones, gallbladder ailments, lower urinary tract and kidney disorders, fluid retention (dropsy or edema), gout, back and leg pain (sciatica), diabetes, high cholesterol, weight loss, high blood pressure, chest ailments, fever, increasing immune function during exhaustion, increasing blood flow in the limbs, increasing urine flow and quenching thirst. Wow! Pretty cool. This rose hip was found on Ram Island in the Penobscot Bay–from a wild seaside rose–not a rugosa, but a smaller native rose. Tomorrow the challenge is to draw your lunch or dinner. I am not sure about how interesting that will be…I will have to really think about what I choose to eat now! 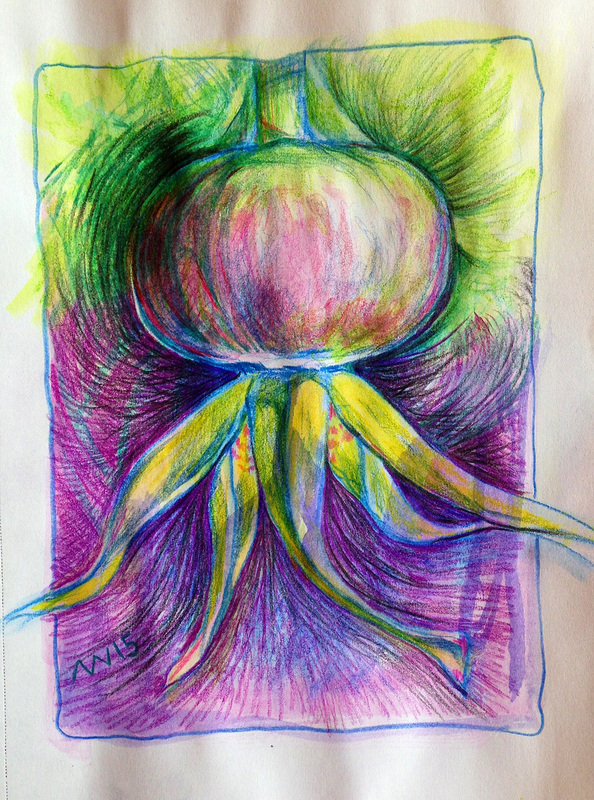 This entry was posted in art, art journal, Medicinal Plant, Plant, sketch and tagged #ajchallenge, art, colored pencil, inktense, maine, medicinal plant, Ram Island, Rose Hip, sketch. Bookmark the permalink.